Submitter: I weeded this book from an urban [elementary] school library. In the introduction it compares professional baseball to slavery, because the players are traded from team to team. I guess that’s the kind of racist comment that was considered acceptable to print in a children’s book in 1976. It gives a very clear answer to the difficult question many libraries with tight budgets struggle with: Is it better to have an outdated item on a topic, rather than no items on a topic? NO. This library now has no baseball biographies, and that’s okay. Holly: Kids today are not interested in every single sports star from their parents’ generation. There are some, for sure, who will never be bad subjects for a school library collection (Babe Ruth, for example), but keep the books themselves up to date! 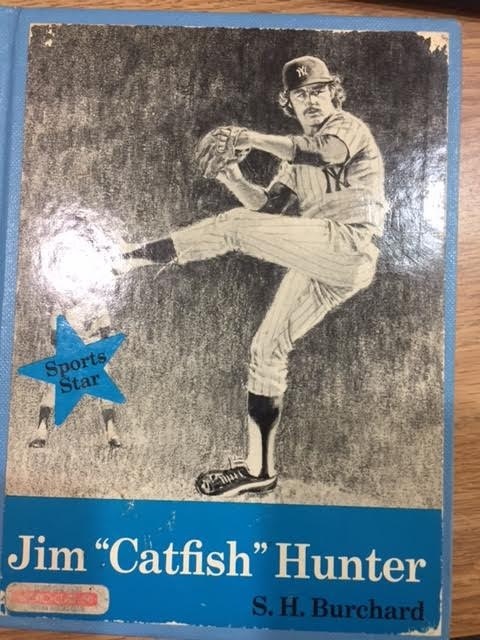 If Jim “Catfish” Hunter is worthy of the collection, there will be a newer book available. (Never heard of him…but admittedly I’m not a baseball fan.) I’m with submitter: NO books on a topic is better than only awful ones. 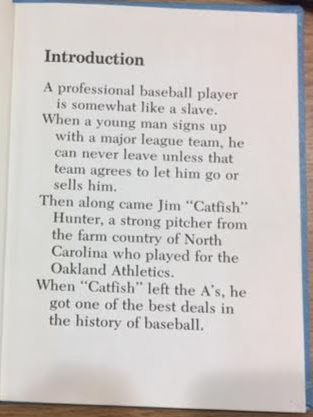 Given that baseball didn’t get free agency until very late in 1975 (when this book was most likely being written), the analogy is neither as bad nor as racist as it appears. Many of the African-American players who fought for free agency made the same analogy. https://www.villanovau.com/resources/bls/history-free-agency-pro-sports/#.WK3NDPkrJnI for more information. That being said, this book is an inappropriate way to discuss such a nuanced topic, which deserves more than an odd (to put it gently) segue into the career of Catfish Hunter. I would look for a better book about the business of sports — surely there must be one for the same age range. This guy isn’t even from their parents’ generation; he’s from their grandparents’ generation. Any book that was written when the person was still alive should be discarded immediately upon their death. Catfish there died on September 9th, 1999. Or 9/9/99 if you prefer. Seriously, this was published the year I was born. What is it doing in an elementary school library still? It should’ve been weeded very, very long ago. The only reason why I know who Catfish Hunter was is because of the fish Jack Lemmon and Walter Matthau caught in “Grumpier Old Men”. Even then I had to have my parents explain it to me. I’m 33. The system in baseball was unfair, yes. But actual slaves didn’t “sign up”. Oh man… I didn’t follow baseball either but everyone in the 70s knew who Catfish Hunter was. Now I feel old. catfish hunter was one of the best, if not the best pitcher of his era. He was from a team that had won three straight series but because it was Oakland and not a high profile city like NY didn’t get his due until he signed with the Yankees. Early (yet unknown at the time) of Lou Gehrig’s disease caused him to retire early. 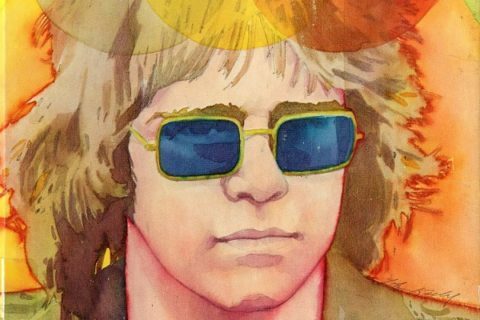 He was a great human being and loved by all who knew him.